How can MSP processes be evaluated, to provide a quality control of the extent to which they achieve their objectives? How can the outcome of MSP be evaluated, to test the extent to which MSP is delivering effective solutions? How can MSP evaluation be carried out in transboundary contexts? Evaluation is just emerging as a field of MSP research and practice, in particular in transboundary MSP contexts. This report presents a proposed framework for evaluating transboundary MSP. The framework sets out proposals for what to evaluate, when to evaluate, who should carry out the evaluation and resourcing issues. A checklist is presented containing a series of proposed evaluation criteria and indicators which was field tested in the two pilot areas of the TPEA project. The checklist is flexible enough to provide recommendations for potential adaptation to other transboundary and national MSP contexts. A practical framework for MSP evaluation was developed that gave consideration to the following, in any given MSP context. What is to be evaluated? This includes setting evaluation criteria. When should evaluation be carried out? This includes proposals for a timed programme of evaluation, ensuring periodic assessment of conditions and levels of use. Who should evaluate? This includes deciding on evaluation responsibilities and suggestions for the involvement of stakeholders. How are results to be presented? This includes the communication of evaluation results, and suggestions for target groups and style of communication. Who should be responsible for spatial data collection? This includes suggestions for spatial data collection and analysis and coordination of monitoring data. What resources are needed? This is to ensure cost-effectiveness. A detailed report on the current state-of-play in MSP evaluation. A practical framework in the form of a quality checklist that can be adapted to any given MSP process and used in an evaluation exercise for that process. The report provides a generic evaluation table that can be adapted to any MSP process. 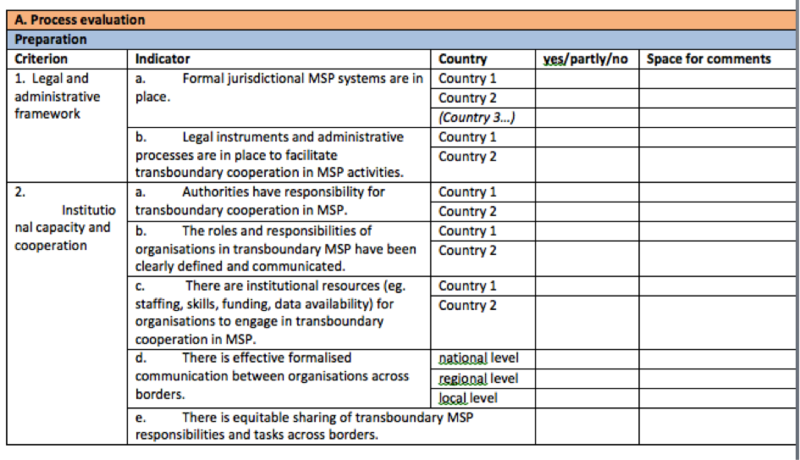 It places emphasis on transboundary considerations, but the table can also be used for MSP within national or sub-national contexts. European Commission (DG Mare) provided co-funding.